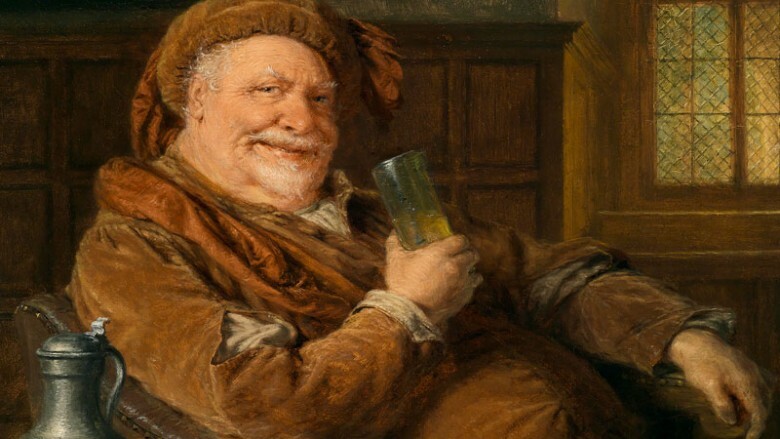 William Shakespeare’s fictional character, Sir John Falstaff, was a great fat knight who was vain, boastful, cowardly and spent most of his time drinking at the bar while living on stolen or borrowed money. Despite these unsavory characteristics, many scholars say that Falstaff was one of Shakespeare’s greatest inventions alongside Hamlet and Cleopatra. So, what is so special about a drunken, gluttonous, lazy old man? His appetite! Falstaff not only has a boundless appetite for food and wine, but also for language, laughter, people, and life. It is these qualities that I share with Shakespeare’s grand character and hope to translate through the wine that shares his name. Falstaff Vineyard is located eight miles from the Pacific Ocean on Falstaff Road, just outside of the town of Sebastopol. The town was established in the 1850’s and became a trade center for farmers from the surrounding agricultural regions. As California’s population boomed post gold rush, more people began to settle in the region to try their hand at farming. Sebastopol quickly became a premier farming area and was known as the Gravenstein apple capital of the world. Today, apples have given way to grapes but its reputation for high quality agriculture remains. Ron and Judy Lougheed purchased their 6-acre Falstaff Road property in 1999 with the intention of growing grapes. Ron, a retired chemist, and Judy, a retired micro biologist for the state of California, were passionate wine lovers and spent many weekends in wine country exploring and imbibing. Excited to start a vineyard of their own, they planted 5.75 acres to Pinot Noir less than a year after they purchased their property. At the time, there were no other vineyards on Falstaff Road and now, two decades later, there are three with a fourth likely to be planted soon. 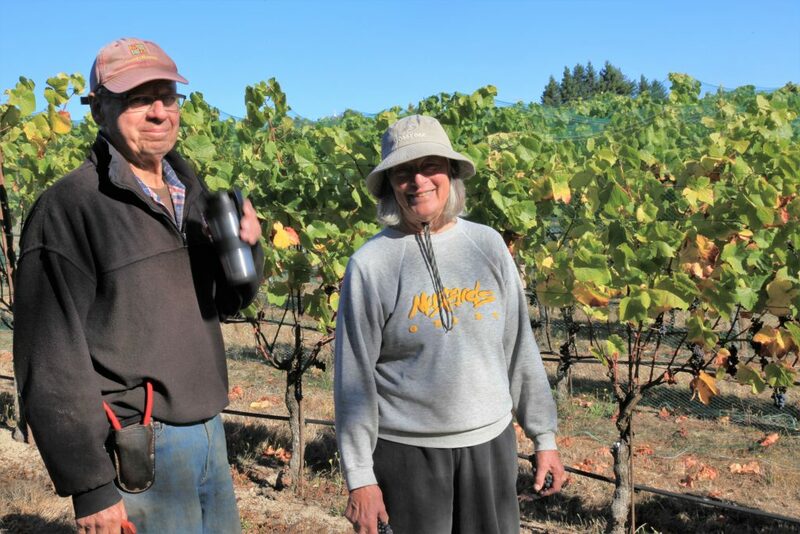 After digging soil pits and working with Jim Pratt of Cornerstone Certified Vineyards, Ron and Judy chose to plant three different clones of Pinot Noir- 828 (ASW2), 115 & 777. The 828 was a “suitcase clone” meaning that the bud wood was brought in to the United States from France by Gary Andrus of Archery Summit. The cuttings skipped quarantine and a laborious, legal certification process and have been propagated throughout Oregon and California. This particular clone of 828 can be easily identified by its peculiar skyward growing clusters (as you can see in the photo). These upright bunches brave an exceedingly cold, foggy coastal climate that, according to weather station data on the property, is consistently colder than Burgundy. “If you want grapes at 25 Brix, you need to go elsewhere. This is a marginal site and ripening is tricky.” cautions Lougheed. Each year, we find ourselves anxiously waiting for the fruit to ripen while threats of the first fall rain loom large. Falstaff is always our last picked Pinot Noir vineyard of the season and historically, the smallest yielding (< 1 ton/acre at times). 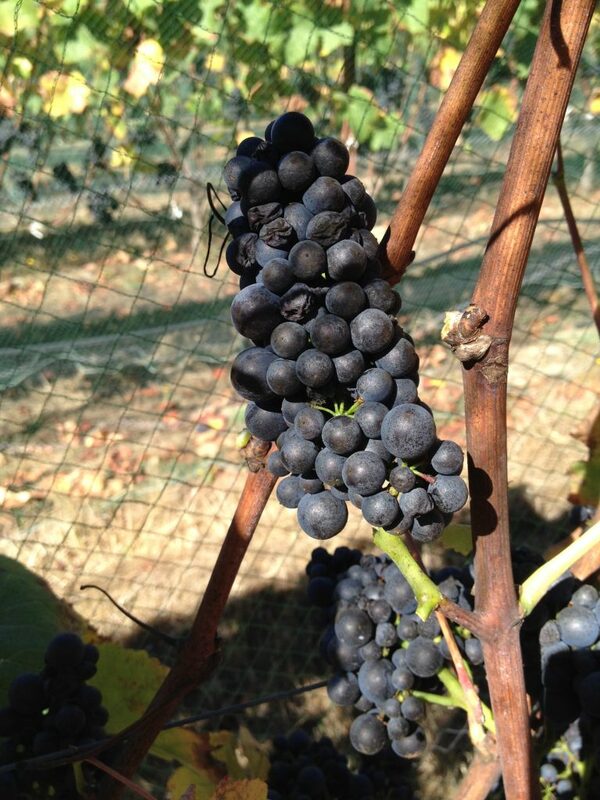 In 2016, I asked Dr. Paul Skinner, a soil and viticulture scientist, to offer some insight and techniques to increase crop size and maximize phenolic ripeness in such an extreme site. Ron put Dr. Skinner’s advice into practice and together we have increased the quality of the wine significantly. As an added bonus, yields have been up year after year. I can confidently say that 2017 Falstaff is our best from the site to date and my personal favorite wine of the vintage. Ron and Judy Lougheed are the antithesis of Shakespeare’s Falstaff; they are humble, thoughtful, and hard working. However, their appetite for growing high quality, great wine and enjoying it alongside mushrooms they have foraged and homemade Pinot Noir jam undeniably harkens back to their vineyard’s namesake! I am incredibly fortunate to work with them and their very special fruit and look forward to many more vintages ahead.